Flower Penny Rug 3, In The Hoop - 2 Sizes! Penny Rugs are so much fun! This beautiful project includes 5x7 and 6x10 sizes and is stitched in applique style. Easy to make, stitch and flip. One small opening to easily close up with iron on adhesive or sewing. Full step by step PDF instructions with photos are included. 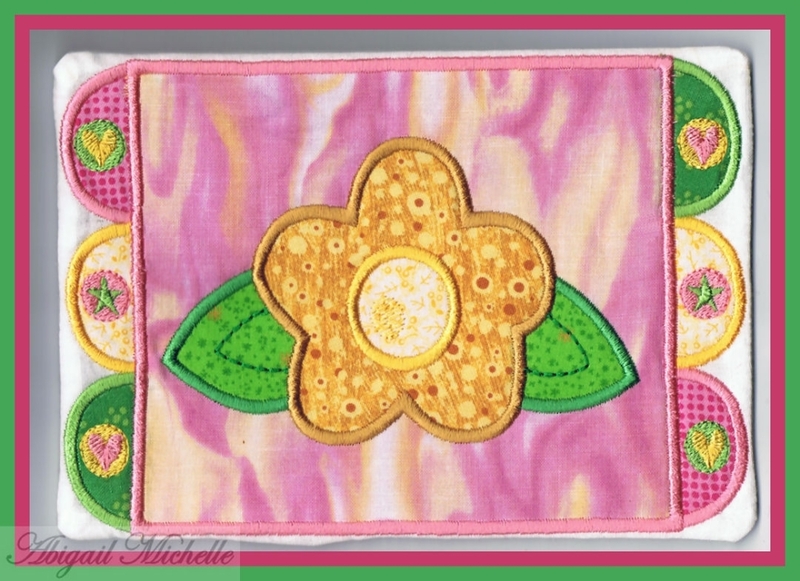 Great for coasters, mug mats, placemats, table decorations and more. Soft and fluffy, it includes a layer of fleece or felt inside. Flower Penny Rugs Set, In The Hoop - 2 Sizes! Finish Size 4.98" x 6.98"
Finish Size 9.98" x 5.98"
This design is also available in a larger set. Just click on the "Flower Penny Rugs Set, In The Hoop - 2 Sizes!" link above in the "You might also like" section for more information.